I don’t have a new miter to show you today (maybe I’m dragging things out because I don’t want the knitting to end!) so I thought I’d answer some questions about the project, and maybe, just maybe, if you’re patient, they’ll be a little contest at the end of this post. Firstly, I’d like to say – what the hell did I blog about before I started this project? Everyday I think about what I’m going to blog and the only thing I can think about are the damn mitres. And what’s with the spelling of mitres/miters? Does it matter? When I spell it miters, do I look like a bumbling American? I mean, I AM a bumbling American, but do I really want to put that out there in the world? Alright. The miters. I currently have 28 unused colors. I have FOUR SQUARES – actually 17 MITERS – left to knit. That’s potentially 20 different colors. I’m not going to use all 28 because I know I’m going to repeat some – but still – I started out with 95 different colors – I think I did pretty good. One of the questions I’ve been getting nonstop since I started this project is about my leftovers. What am I going to do with my leftovers? I’ve been offered money for them. One beautiful knitter offered to take my leftovers and knit me something from them. Others have been so kind as to take them off my hands – FOR FREE! As if I didn’t want them. PEOPLE. I’m KEEPING the leftovers. I’ll do something with them eventually and if I don’t, they’re still mine. It’s like when you read a book – you don’t give it away when your finished. You put it on your shelf and there it sits forever collecting dust because it’s now a part of your soul and you can’t ever part with it. Yarn is just like that. At least the yarn for this project is like that. So give up on the leftovers. They ain’t goin’ nowhere, no how. 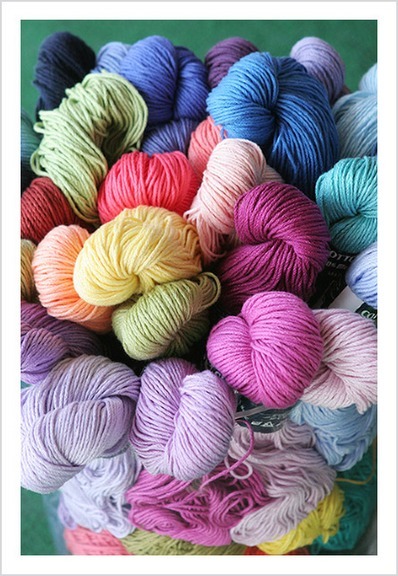 Another question I’ve been getting – did I have all this yarn in my stash? Well, sort of. Last January, I bought four grab bags of Tahki Cotton Classic from WEBS on the advice of the mitre master, and then stuck them in my closet. I had no idea what I was going to do with them. No project in mind at all. Then one afternoon I mitered and the rest is history. Pretty quickly I started buying up all the different colors I could find and I ended up with 95 different colors. I think. I have to go back and check, but I’m pretty sure that’s the final color count. More answers: I will be putting a border on it – I’m thinking a dark garter stitch. Single color. Simple. Maybe black. I haven’t given any thought to a back. I don’t think I’m going to back it, but you never know. Never say never. I have thought about mixing up all the squares and making it completely random, but that’s a different blanket. The rules stay. I will not be placing the same color miters in a particular square at opposite corners ALL THE TIME. I will do this occassionally, whenever I see fit. Chuck Close has been mentioned before. I like Chuck Close. Have seen his work up close and personal. In fact, once, a long time ago I was looking at a Chuck Close at MOMA and Vincent Price was looking at the painting next to me. I have noticed – especially when finishing one miter and starting another – that the color of a yarn can look SO different depending upon which color it’s up against. Very much like it’s a different dyelot, but I can assure you, I’ve only used ONE SKEIN of each color I’ve used. I mentioned before that I’m getting five miters out of a skein – four dominant color mitres and one background color miter, but your mileage may vary. Everyone knits different and just because that’s what I’m getting – you may knit loser or tighter or whatever and get a different result. Some of the squares have a color repeated twice in the background and some of them have four different backgrounds and I’ve made these decisions on a square by square basis. The rule that there is one constant MAIN color has remained constant. And will not change. I think I answered a lot of the questions I’ve been getting, but if I missed yours, please ask again. It’s been a while since I’ve given anything away and I’ve got a bunch of fairly new readers and I used to give stuff away all the time so I’m feeling guilty about not giving stuff away and you’ve all be SO SUPPORTIVE of this project and while you say you love it and I believe you, I know that some of you can’t stand to look at another freaking miter, so I’m going to share the love. I mean, really, what’s the good of being MAD if you can’t share it, right? In the body of the email give me a date and a time – like this: 4/29/07, 11:53PM – (THAT’s MONTH/DAY/YEAR because I’m a BUMBLING AMERICAN!) for when you think I will finish the LAST MITER! (Not the border, not sewing it all up – just knitting the miters.) And you can say hi if you want but it’s not necessary. ONE ENTRY PER PERSON! The person who comes closest to the winning time WITHOUT GOING OVER will win. IN THE CASE OF A TIE – I will choose from the winners AT RANDOM. ETA: I SCREWED UP ABOVE and said that I had only 4 miters left to knit. As of this edit, I have 17 MITERS to go. If you entered the contest before 11 PM EDT and would like to re-enter based on this CORRECT information, please do so. Thank you and sorry – I’ve got miters on the brain and I can’t think so good. PLEASE – DO NOT LEAVE YOUR ENTRY IN THE COMMENTS. Entries left in the comments will not be counted. A couple things to know – I will be working (photo shoots) both Saturday AND Sunday this weekend, but I will be sleeping at home. Have fun. Play safe. Peace out. Hi Cara, I’m not ‘seeing’ the email address to use. I just see ‘blank’ space. All of your other links I can see. Maybe I’m missing something? Love your site nevertheless. Same comment as Kim – I can’t find an e-mail address. I’m a new reader and the blanket is beautiful. Adore the miters! 95 colors boggles my mind! I’m definitely pondering knitting my own miters. I have the whole month of January off every year and may save it for then, so the miter madness can take over my life and I can still keep my job! Of course you’re keeping the leftovers. Really now. Leftovers are much yummier. I love contests! But you do know, don’t you, that we’d still read every single mitered entry anyway. Don’t you? And spelling it miter does tend to flag you as an American, but not necessarily a bumbling one. Although if you want to bumble, by all means do. “what the hell did I blog about before I started this project?” — you blogged about socks, on occasion… I’m currently holding a contest for some Louet Gems. Coincidentally. “what the hell did I blog about before I started this project?” — you blogged about socks, on occasion… I’m currently holding a contest for some Louet Gems. Coincidence? I think not. If I’m honest…I don’t want the mitering to end! I’ve loved every single moment of it. I come over and stare at all your different color combinations all the time. It sort of sounds stalkerish…but its not, I swear. I just love al the color. I’m still reeling from reading yesterday that you’ve knit 100 miters in what feels like just a moment. Didn’t you just start knitting this afghan?! I think if it’s “miter” in MDK (and I’ll have to check my copy when I go home) then “miter”s it should be – after all, that was your inspiration!! Your miters are makin’ me want to get creative with color in some way, even if it’s not knitterly miters – I still feel like I NEED to finish what I’m knitting on before starting another project!! OH – and I’m lovin’ the randomness of your blanket – aren’t you a random kind of woman!! Socks. You blogged about socks. Oh wait – I see that Rete beat me to the punch on answering that question. Still. It was lots ‘o socks. Oh, and a few log cabins. Which made me first feel the sock-love, then the log cabin-love, and now the miter-love. Either I’m very suggestable, or you’re very persuasive, or both! I think the real question is not what you blogged about before this project, but what the hell will you blog about after this project is over? I’ll look forward to finding out what grabs your interest – and your vision – next. My students and I were surfing after school today, and we saw the blanket layout. The girls and I really like the pink square, and we think you should make a similar one in your last row! It looks great so far! When I left my comment on the spelling, I actually did check to make sure that mitre was a miter. I think mitre is the British spelling, but I don’t think one would think you a bumbling American based on your spelling. But then, I’m pretty lax when it comes to spelling words when different countries have different spellings of the same word. You know, color/colour, grey/gray, miter/mitre. I like choosing which spelling I like the looks of and using it. It’s the aesthetics of the word. Hee! I’m not a cotton knitter…I have a stash of off white cotton yarn waiting to be a sweater for my mom…we’re on year 5….so I won’t enter your contest. I will say your blanket is too cool. I’ve loved watching your miters come together and your discussions on colour combinations and how you came up with them. Your blanket will be lovely when it’s all together. Mmmm, the yarn photos are gorgeous. And why would you get rid of the leftovers? I use leftover yarn to decorate my apartment. Well, I use new yarn for that, too. Heck, any yarn. But leftovers work well! This probably seems like a stupid question, but you don’t appear to have used black in any of your mitres (sorry, British spelling same meaning) so why use black on the border of your finished project? It seems so funerary – if that’s a word. You know what I mean! Please choose a more carnival/celebratory colour. This whole project has been a labour of love, or maybe madness. But I have so enjoyed following its progress. Please suggest another colour for your border. Please??? Huge apologies for the repeated message. I wasn’t aware of the delay – I just thought my own computer was playing up. It won’t happen again. I love keeping leftovers too, they’re just so fun to have around. Your miters really make me want to knit some, but it seems impossible to find suitable yarn in the UK(tons of colours, not acrylic and cheap). The blanket is amazing – I’ve loved seeing each square and watching the blanket evolve. Can’t wait to see the finished project! Remember I said I was limited in my multicolor blanket experience? Well the first was made out of Mission Falls 1824 Cotton and the second was made from the leftovers, augmented by the three skeins of the yarn’s triumphant return from discontinuation. Four years in between, it was vintage. No sell-by date on yarn. Seriously- you are killing me with all this mitre/miter blanket love. And also with your wonderful, supportive comments. And last year at Sheep & Wool, I would like to go on the record as saying that I had no intent to accuse you. The passion you heard in my voice was just sheer admiration . Kind of relieved to NOT be going to Sheep & Wool this year. You should totally be a counselor(sic) at Sock Camp next year. Your class should be something like: Making a study of color and the upside/downfall of being a Nut (in the best possible way). I’m still working on the title, bear with me. Your blanket really is breathtaking. You stood next to VINCENT PRICE??? I am so envious! I LOVE that man! Watched all his movies as a kid on Creepy Theater Saturdays on TV. He was a very proficient, savvy art collector from what I’ve read. 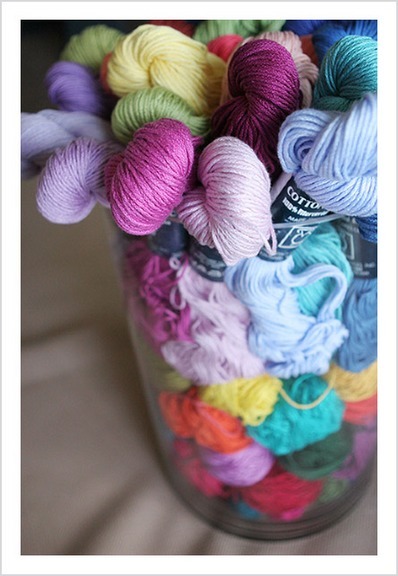 I’m just going to gaze at that jar full of yarn. Just lovely! Oh poo I was hoping for another miter picture. The left overs are still pretty together though. A good friend (and I mean GOOD, especially when I got the finished item) made my newborn son a fabulous mitered square baby blanket and backed it with flannel. It’s wonderful. It really looks great backed. I, too, love to see what color combinations you come up with, and I almost don’t want it to end! Keep up the great work. I love what you said about the leftover yarn. I have every yard I’ve ever had left over, and I couldn’t possibly give them away. They’re little reminders of projects gone by, and just touching and looking at them brings me so much joy. I’m glad I’m not the only one who keeps them! The miters, your miters, have thrilled me since you started posting about them. I have thought about them endlessly, gone to your blog to look them over time and time again, and marveled at how magnificent they are when you lay them out together. Oh, I just think they are heaven! Yes, i am going to do some of my own, but they will never achieve the beauty of using such a wide variety of colors. Keeping all the leftovers? Just like books? Ummm – I donate hardbacks to the library all the time, as well as adiobooks, except for those rare ones that I know that I will re-read. Their budget is not high, and the joy of those books will be spread to others. Different things appeal to all of us. Do you all think a beginner could knit a mitered blanket, or is it too involved? I went to the Cotton Classic page, opened the color card, counted 109 colors. 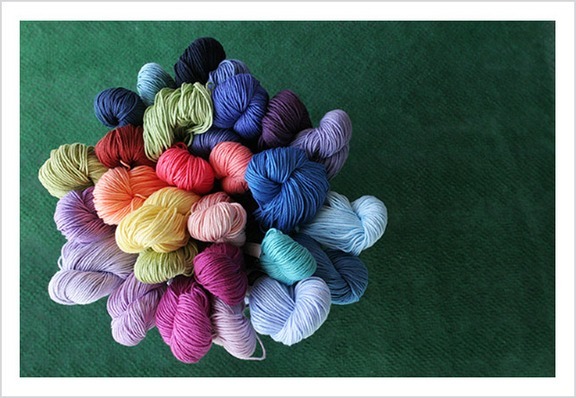 In case you needed a 14-skein excuse to start the next one. I love the photos you’ve got on this post. Would be great for notecards! 🙂 I’m a sucker for good colours. And here I thought you meant the last mitre you would knit EVER. Because I’m guessing that will be when your hands can’t hold the needles anymore.